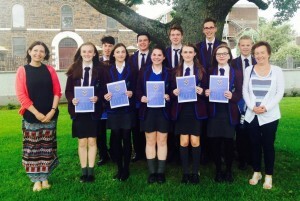 Last Thursday witnessed great scenes of celebration at Dalriada when this year’s GCSE results were announced. Every single Year 12 pupil achieved at least 5 or more A*-C grades, including Maths and English. 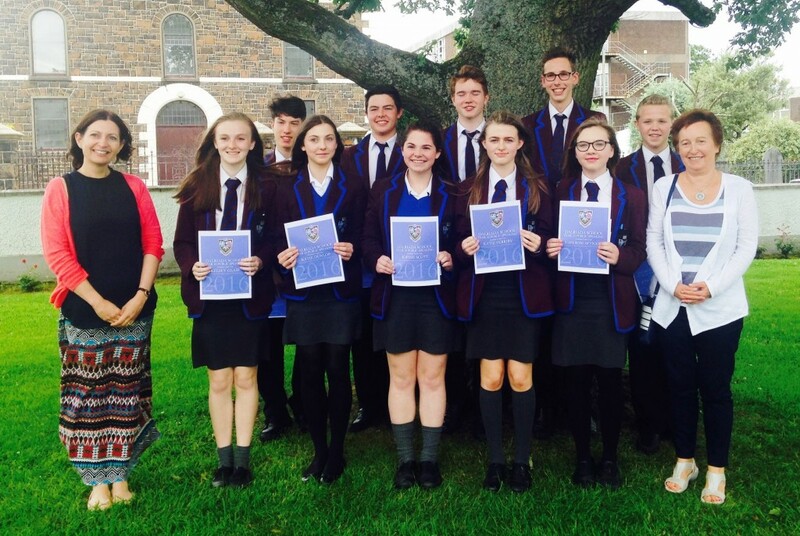 Indeed a staggering 98% of all Year 12 Dalriada pupils gained at least 7 A*-C grades including Maths and English. 38 pupils, almost a third of the entire year group achieved 8 or more A* of A full course grades and of this group 24 pupils gained 9 A* or A grades each.Michael White will start his A level courses having achieved a superb 10 A*’s each, while Jazmine Carson, Eason Chan, Shane Devers, Ross Fallows and Peter Johnston achieved an outstanding 9 A*’s. 11 pupils achieved an outstanding 10 A*-A grades:Michael White, Jazmine Carson, Eason Chan, Shane Devers, Ross Fallows, Peter Johnston, Catherine Jamison, Catherine Torrens, Cara Dorans, Bruce Johnston, Ellen Kearney. Patrick Stewart, Benjamin Webb, Emma Colgan, Olivia Hall, Robbie Doherty, Katie Trotter, Jessica Eden, Daniel Logan, Daniel McAfee, Benedict Anslow, Natalia Rygielska, Mia McNeill, Eve Myer. Delighted Headmaster with some of the 17 pupils who achieved at least 3A*/As in the recent 2016 exams. This year’s ‘A’ Level pupils at Dalriada have maintained the high standard of success achieved by the School in external examinations. 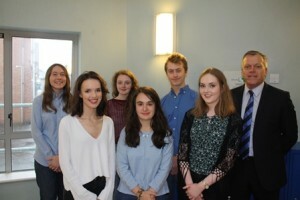 A very impressive 77% of the Upper Sixth Form students obtained at least 3 A*- C grades each. Almost 40% of all ‘A’ Level grades obtained at Dalriada were A* or A grades, well above the Northern Ireland average. 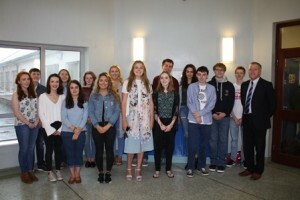 Naomi Anderson, Gillian McNaugher, Ailbhe Kendall, Victoria Whitton, Tara Devers, Rachael Kennedy, William McMullan, Roisin Mc Keegan, Christopher Fielding, Bethan Harper, John Hope, Bronwyn Thompson, Honor Wilson, Sam Balmer, Karolina Bednarek, Caitlin Farrell and Angus Johnston. Naomi Anderson, Gillian McNaugher, Ailbhe Kendall, Tara Devers and Rachael Kennedy. As we approach the end of the academic year 2015-16 and await the arrival of the results of both A level and GCSE, we must recognise the two long serving members of staff who will not be with us in the 2016-17 academic year. 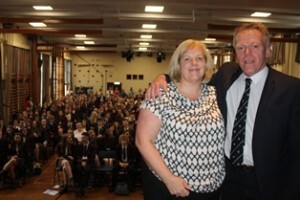 The end of term assembly marked the end of an era with the two long serving members of staff leaving the school. 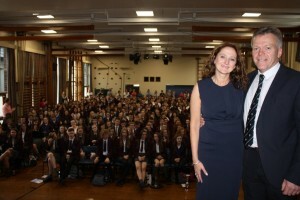 Senior teacher Mrs Helen Leighton, retired after 34 years at Dalriada and Pastoral Deputy Head Mrs Nicola Madden has left after 18 years at Dalriada to take up an appointment as Principal of Limavady Grammar School. On receiving their leaving gifts at the school’s final assembly both ladies received a standing ovation from the packed audience reflecting the esteem they were held in by colleagues and pupils alike. Headmaster Tom Skelton paid tribute to Mrs Leighton and Mrs Madden, thanking them for the huge contribution they had made to many aspects of life at Dalriada School. He concluded by wishing them both well for the future. Students are reminded that A level results are available from the school on Thursday 18 August. They can be collected from school between 9 – 11.30 am in B5 (Careers Room ). If you are not able to collect your results in person you can ask a member of your family to collect on your behalf. Please supply them with a note of permission to bring with them on the morning. If you prefer to receive them by phone, please contact the school after 11 am. The office will not open until 11 am as the staff will be involved with the distribution of results in B5. Good luck to all students receiving results and we hope that they receive the grades enabling them to progress onto the course of their choice in September. 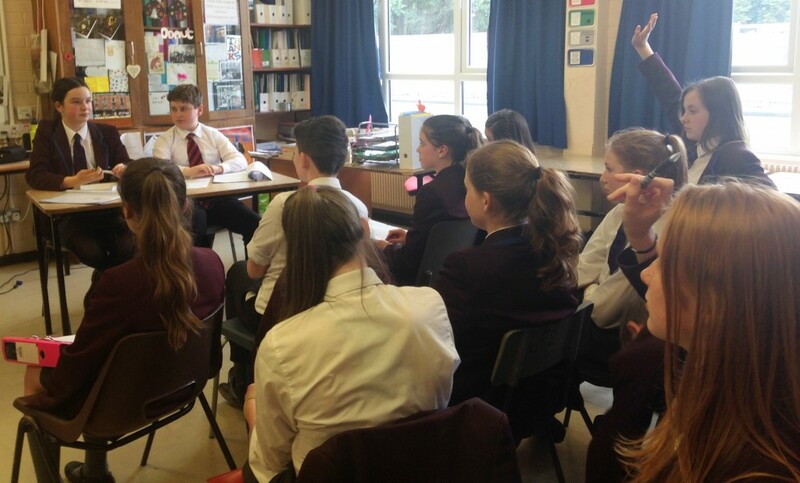 Pupils in 8W brought The Boy in the Striped Pyjamas to life this week by engaging in a fantastic debate to decide who is responsible for the deaths of Bruno and Schmuel! Well done, everyone! Congratulations to Holly Harrison who was wonderfully persuasive, winning the most votes from the House, and succeeding in convicting Father! 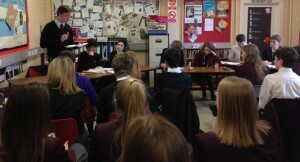 This year was marked by a flourish of new debating talent within the school – after the departure of a very talented group of Upper Sixth debaters made way for a whole new wave of Speakers from Year 11 to Year 14! Reigning Queen (teacher-in-charge) of the Senior Debating Society, Miss Turner, spent her sophomore year at the heart of the Club, ensuring, through her passion for arguendo, that the year was a very successful one for all involved. This year I had the pleasure of assisting in the role of Student President, and I have to say that I thoroughly enjoyed my year at the helm of the Debating Society. On Wednesday 22nd June 2016, five boys and five girls from Year 10 competed for the Jonathan Logue Public Speaking Cup. Each year, the standard is extremely high; however, this year it was exceptionally so, presenting the judges – two previous, and much missed, members of the English Department, Mrs Marion Hadden and Ms Hilary Timmons – with great difficulty in awarding the top three places. In the tech savvy world of today, online shopping has been booming to the tune of £52 Billion in sales for 2015. The convenience and user friendly nature of online shopping has seen its popularity skyrocket in recent times but did you know that by shopping online you can help to support our School? Dalriada is pleased to announce that we have partnered with easyfundraising.org.uk so that every time you make a purchase online, you can help provide the school with an average donation of 2.5% of the total you spend. There is no catch, the average 2.5% is not an added cost, it is donated by the selected group of online retailers who also work in partnership with easyfundraising.org.uk. Here is a short video that explains it all. For further instruction click the read more link.